This must be a phase 4 year old boys go through (and perhaps girls as well), but all pretend play in the C-house at the moment is to do with, “Die!” Or “Dead!” Or kill, eat, bite, you get the drift. Whether it is fire-breathing dragons and knights or Star Wars or monsters, there is a lot of gore involved, much to my chagrin. M seems quite nonchalant about the situation, and more often than not, encourages the boisterous behaviour by being party to it. Talk about boys being boys. So J has acquired a sword, a light sabre and a T-rex. Schleich have recently added to their collection of wild life sets, and he now has a set of scary sharks and a lioness to add to his ‘Die-Attack-Eat’ toys. 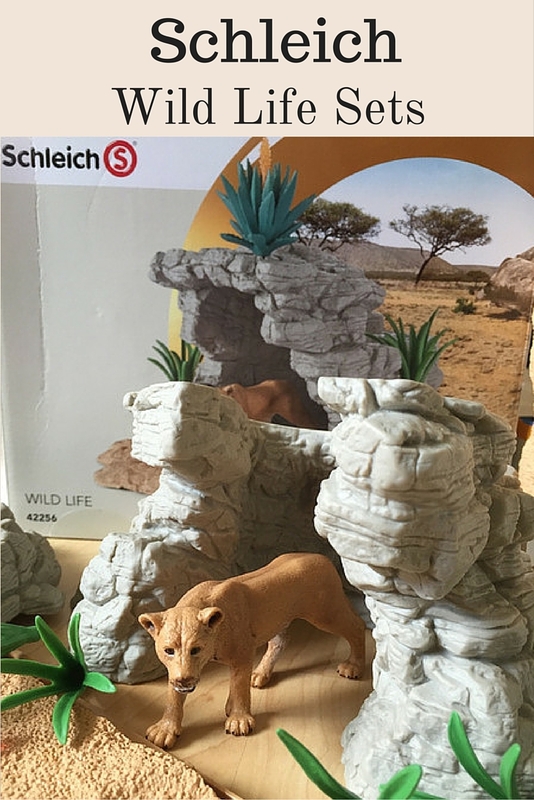 As with all Schleich toys, these wild life sets are made of great quality material and are hand-painted. They do look very life-like. 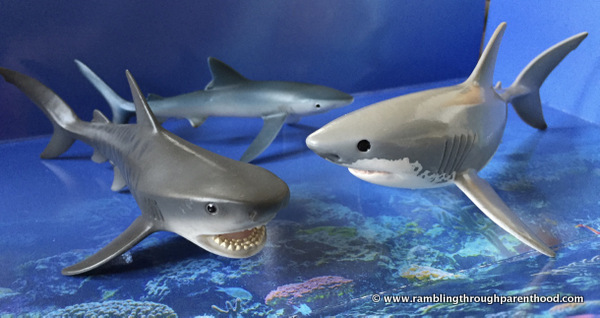 The Wild Life Schleich Shark Set comes with three fierce predators, the blue shark, the tiger shark and the great white shark. 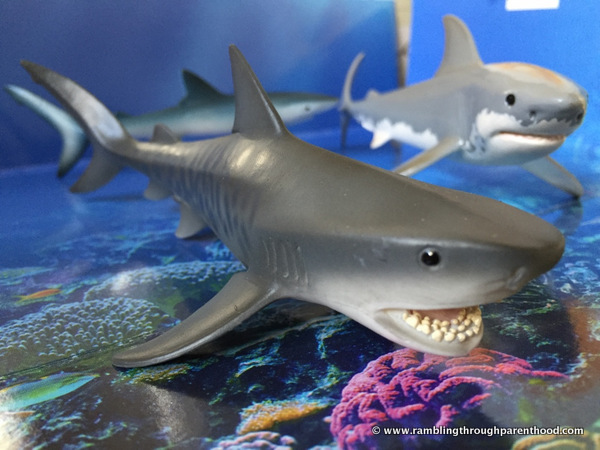 The attention to detail on the figurines is quite astounding, be it the menacing fin and snout of the great white or the characteristic stripes of the tiger shark. The fins and tails on all three are an extension of the main body, that is, they are not glued on separately. I think this makes them sturdier and more likely to withstand rough handling by pre-schoolers. 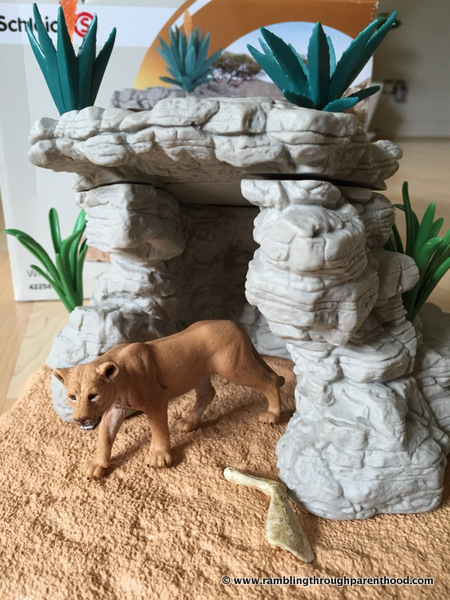 The Schleich Cave Play Set includes a desert lioness with her teeth bared, ready for the hunt. 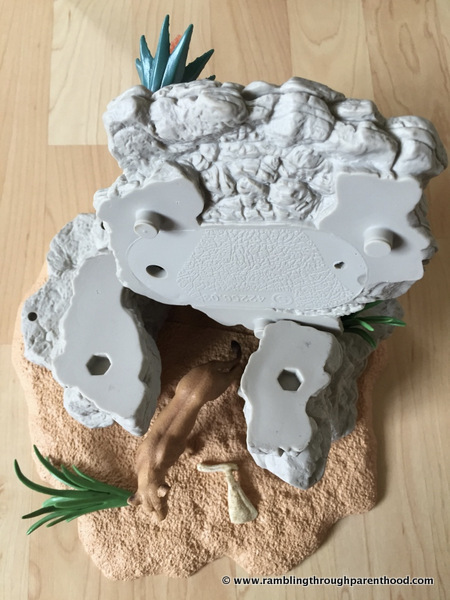 The cave comes in easy-to-assemble parts and plants that can be rearranged to change the look of the set. There is even a very realistic looking piece of bone, presumably from the predator’s previous meal! My son has been thrilled with these new acquisitions. There has been a lot of imaginative play and there have been endless questions around what animals eat, why they eat other animals, why we eat animals and plants. These wild life play sets by Schleich have proved to be more than just toys. They are learning tools and a fantastic opportunity to introduce concepts of food chains, food choice and food waste to young, inquisitive minds. Disclosure: We were sent these play sets for the purpose of this review. All opinions are my own. This post contains affiliate links. They look brilliant for kids, My nephews are both into cars though but I'm sure my nieces would love these sets.. I love these sets, they are so great for imaginative play and learning. These do look really great. I like the look of the sharks. Sylvia would probably like these!